I did a short stint at an all boy's high school where the resident rugrats would place a small mirror on the stairway hoping to catch a glimpse of a female teacher's underwear. Thanks to my darling brothers who were studying there at the time and were no better than their mischievous counterparts, I was clued in on all their tricks. If you showed one hint of vulnerability, these testosterone ridden apes otherwise disguised as boys would tear you down and fed you to the vultures. One day, one of the new teachers ran crying back to the staff room, sobbing inconsolably after lasting barely 20 minutes in the classroom. It turned out that my dear brother (note the sarcasm) and his buddies were running a daily countdown to see how long it took to make her cry. Apparently, 20 minutes was the new record. "Why??! ", I asked my brother seething and trying to restrain from strangling him. "Because she dresses weird". Fast forward many years later. A number of my former students were shipped off to New Zealand where I had been living for a while to finish their tertiary education. Two inadvertently saw me at a mutual friend's house and ran screaming into the street. Another time, I happened to be seated next to the ringmaster of the troublemakers. He was busy picking up a girl and hadn't notice me. He turned around, eyes widened in horror and promptly toppled backwards. "Miss Marlene, what are you doing here?, " he stammered. "Watching you". I adore biker jackets because they remind me that I can be a badass especially when I got them on. Both are great looks, especially the second one! Love your Ted Baker leather jacket! That Kelly is divine (needless to say). Ted Baker leather jacket..gawd..I love!! Mona & Chicology, I bought the Ted Baker jacket on eBay for £99. Similar jackets have popped up on eBay from time to time. I think the retail price was £395 at Selfridges. I-Ping, I'm deathly scared of skulls :P BUT, I would LOVE to own a Medor clutch. That would truly make me a badass. That is such a sad story. Students can be so mean. I love teaching so much and most teachers really do have a heart of gold (most). That's why they are there I guess. But boy, can they be mean! I LOVE biker jackets. Especially ones with asymmetrical zippers! SO gorgeous! Love the last one especially! Oooo, I am loving that Ted Baker jacket! Hilarious!! How I love a good Biker jacket! Fab outfits as usual! Marlene!! I LOL when I read that last sentence! Wasn't expecting that, but I LOVE that you feel like a bada$$!!! The top outfit is just perfection. The epitome of classic with a modern twist. Thanks for sharing those stories. That's hilarious! i have a jacket just like that second one, but have yet to rock it anywhere. i really need to. it's super cool. You have such a perfect collection of Hermes bags - love love your Turquoise chevre! 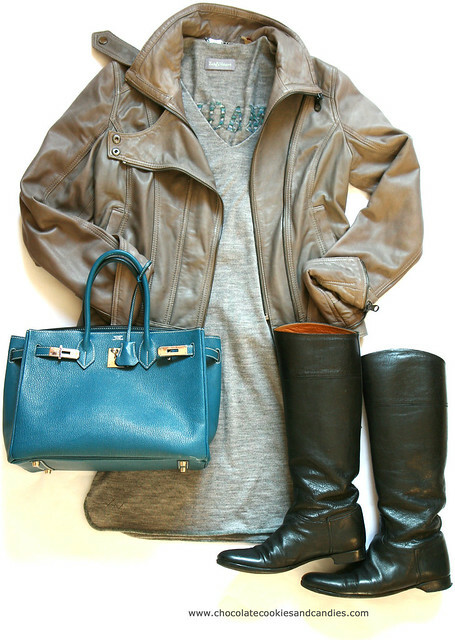 Paired with the gray leather jacket it is perfection! I love the outfit, the design, and the color of it. You really gave me a idea on what should I wear on my biking together with my old acquaintance next week. i think if you get a biker jacket in black leather your ex students will pee in their pants. Hilarious post! Congrats on being such a badass, Miss Marlene! Love these outfits. Oh my goodness. Go you for scaring the crap out of those boys! I love biker jackets, and both of these outfits are great. I'd have to say the first one is my favorite. 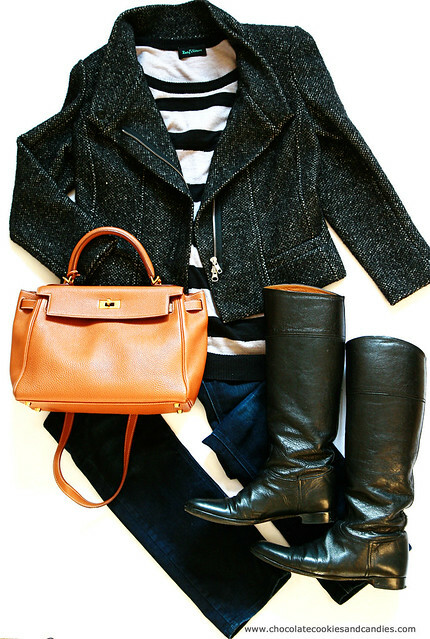 I adore the striped shirt, and the bag is GORGEOUS.